Of an eastern European decent, Victor fled Ex Communist Romania as a child with his native mother and father. First traces of musical inclinations came early in his childhood, his father being an audio engineer allowed Victor to interact with equipment as well as being open to a wide range of music. His first experience with electronic music came in early 1986 while attending Cafe a small club in Greenwich CT, where Moby was the resident DJ. After watching and listening to Moby blend a wide range of music from early house beats to the Nu Wave/Industrial movement at the time, Moby's ability to move and control the crowds became a major inspirational factor in Victor's career. His first residency and also the first time he had a live audience came at - Nightbreed - a new night which catered strictly to NuWave/Goth/Industrial sounds. The night was a big success and catapulted him to new heights after which a whole array of guest spots to such legendary clubs as : Palladium, The Bank, Ivy, Red Zone, Mirabelle, Dragon's Lair, Citi Limits... came about. As few years passed by during which he built a great name for himself and developed quite a following. Early influences from Belgium, Holland, Germany steered Victor to grasp and experiment with a variety of sounds. 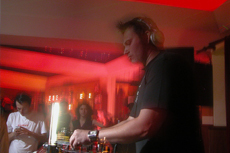 Around 1992 he started to experiment with more than just the industrial movement and reached into Gabber, Tribal House, Hard Trance and Acid Trance. 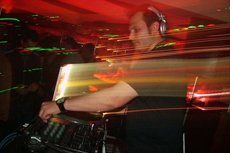 He gravitated towards Trance which became his signature sound. 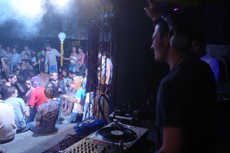 Understanding the shift in music and with the new underground parties available he decided to change with the times and pursue these new electronic sounds. He found himself blending a powerful mix of synth and hard driven 303 acid lines. He knew it would be a challenge to rise to the top, but he was driven to do so. In 1994 re received his first break which marked the beginning of what defines DJ DREAD today. He was invited to play - Empire Strikes Back - with DJ's such as : Josh Wink, Dave Trance, James Christian, Reese and Overload. His set at this event set a standard of what Dread was about to bring to the tables for years to come. Very determined and driven to expand his horizons he released numerous promotional mixes. First mix being Nebular which followed by abducted, Revolution, Future Shock, Uptown Underground, Ultimate Frontier and Revolution 2k3. Gigs started to follow which exposed him to a variety of places such as: Europe, Caribbean, North American cities and states such as: Arizona, Colorado, Seattle, Miami, Ohio, Iowa, Pennsylvania, New Hampshire, Rhode Island, Massachusetts,IL... etc... These promotional items along with his passion for pushing the envelope with his music put him on the map as one of the most recognized names in the Trance community to come out of New England. Next step was to form his own production company where he and his partner Ronald Sansone were to push their vision of what raves were to them. 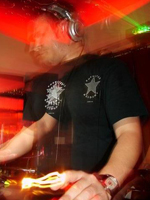 Presently, he's always searching for new sounds, constantly changing with the times and expanding his horizons with new ideas... he's well known for his hard driven sounds, but you can always see him spin an array of tribal, tech house... always with a hint of techno, always on the edge... and as always, he'll push the underground resistance forward.